UNC Asheville’s master plan will articulate a long-range strategy that establishes a vision for how the university’s physical use of land and facilities can advance the institution’s mission, vision and strategic plan. The plan provides continuity. 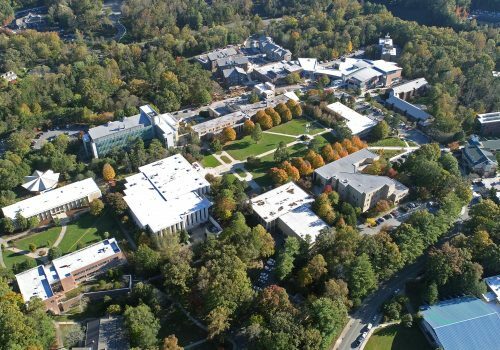 The plan provides continuity across time, and gives UNC Asheville a common framework for addressing the master planning guidance in the Strategic Plan. It is the means by which UNC Asheville can balance competing interests. Planning seeks to strike a balance among the many competing demands by creating development patterns that are orderly and rational, provide the greatest benefits for constituents and the institution as a whole and resolve conflicts. It is the means by which UNC Asheville can protect capital investments. Well-planned, orderly and phased development patterns are less expensive for a campus to conduct business serving multiple constituencies over a longer period of time than scattered development. from destruction or degradation by inappropriate development. It provides guidance for shaping the appearance of UNC Asheville. A plan can set forth policies that foster a distinctive sense of place, belonging, and community. It promotes economic development. The plan contains valuable information that can drive the enrollment decisions of prospective students, community engagement, and economic impact of UNC Asheville. It provides justification for decisions. Master plans provide a factual and objective basis to support decisions and can be used to defend their decisions if challenged. The Master Planning Steering Committee has been meeting regularly since January of 2018 to develop a schedule and strategies for the master planning process, collect preliminary information about UNC Asheville to inform the committee’s work, and develop a request for proposals for an external design consultant to facilitate the planning process and creation of the master plan. After a thorough and engaging RFP process, Duda | Paine Architects, based in Durham, NC, was selected as the designer for UNC Asheville’s master plan. Duda I Paine Architects toured campus on September 19, 2018, as a kick off to the Master Plan effort. The Design Team will subsequently host several work sessions to build consensus with the Master Plan Steering Committee (MPSC) and other stakeholder groups on and off campus whose input will inform the master plan. The Design Team has proposed dividing the master planning process into five distinct phases. Because design is a non-linear, iterative process, the phases of master planning are fluid and may overlap or not occur specifically as outlined below. For example, info gathering will take place throughout this process as the process and plan design evolves. During the first phase the Design Team will analyze data collected from the MPSC and other University sources, develop diagrams and studies relating to observations (campus visits and site tours in tandem with meetings) and University needs and participate in Master Planning Committee meetings. The primary focus of this Phase is to collect, analyze and report on the existing conditions of the campus and to assess areas for improvement. The Design Team will further develop solutions and analysis based upon the previous phase and conduct a one-day visioning charrette that will include the MPSC and staff, administration, faculty and students. This process is used to make informed decisions regarding the Future Programming of the Campus Core and peripheral properties and to develop a set of Guiding Principles that will inspire the work and be reflected in the Master Plan. Open participation will allow work products to reflect consensus of the group and University as a whole. The Design Team will further develop solutions and analysis based upon the previous phase and conduct a one-day design charrette that will include faculty, staff, administration, students and members of the Asheville and community stakeholders. This process is used to make informed decisions regarding the scope, vision and ultimately the design direction of the UNCA Master Plan. Open participation will allow work products to reflect consensus of the group and University as a whole. The Design Team will further develop solutions and analysis based upon the previous phase and conduct a one-day design charrette that will include faculty, staff, administration, students and members of the Asheville and community stakeholders. This process is used to make informed decisions regarding the final design direction of the UNCA Master Plan. Open participation will allow work products to reflect consensus of the group and University as a whole. During this final phase the design team will present the complete Master Plan and generate a final report booklet to comprise the final deliverable. Please email masterplanning@unca.edu with any questions or feedback regarding UNC Asheville’s master planning process.